I ran across an article by Dean Seddon recently about why people don’t come to church and it got me thinking…not so much about those specific reasons that he mentioned, but rather about the church marketing approach that we churches use. There are reasons people don’t come to church. Are we making sure that we are addressing those reasons in our marketing campaigns? 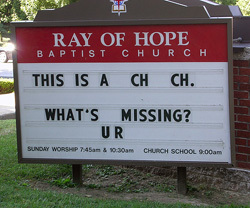 More than that, are we giving people a reason to come to church? There are a lot of reasons people don’t attend church. The list could go on and on I’m sure. Some of the reasons listed above are personal opinions and perceptions, but others are real world problems that have to be solved for the person to become a member of your church. For example, your church can tell my how exciting the worship is and how “real” your members are until you’re blue in the face, but if i don’t have a car and thus no way to get to your church, I’m not going to come. That’s a real-life problem that has to be addressed before I can come to your service. Take some time to come up with possible real-life issues that prevent people from coming to your church and come up with ways to address them. For the example above, maybe your church has a bus or could create a carpool system. If a person works on Sundays, maybe your church has a service or functions on other days. 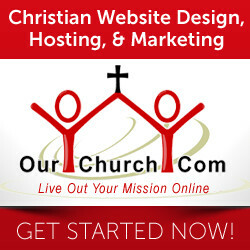 For people who travel a lot, perhaps you church offers streaming services and other online features and functions. Be sure to mention these options in your marketing campaigns, including your website. Many reasons why people don’t attend church are due to preconceived ideas of what church is. This may be based on TV stereotypes, past experiences, or just things they’ve heard. One possible marketing strategy is to attack these preconceptions in your marketing campaign. There is a church in my home town that advertises itself as the church for people who hate church. They’re basically saying, “Look, we aren’t like what your preconceived idea of church is. So, try us out.” That church’s approach is pretty broad, but you can address specific preconceptions as well, whether it’s advertising a contemporary service, describing yourself as real or sinners, etc. Of course the most important part of this is that your church has to fit your description. Don’t describe yourself as contemporary just because you have a guy playing guitar for the hymns instead of an organ. The last group reasons people don’t come to church are neither real-world obstacles or preconceived notions, they are simply that the people don’t have a good enough reason to come to church instead of doing something else…like getting out of bed. For these reasons you must give a reason for people to come to your church, a reason compelling enough to win out against the competition. What does your church offer? I think these reasons have to go deep. “Our church has an awesome praise band.” isn’t going to cut it. What do people really want? Maybe they want to find meaning for their life, to fix their marriage, or get help with an addiction. Talk to the inner longings people have. One other thing to consider is how you deliver that message. If you are trying to reach the unchurched, speak their language. Not everyone knows what “sins” are. For some people “grace” is something you say before dinner. So, think outside the church language box and find the words that will properly communicate with the people you are trying to reach. Giving people a compelling reason to come to your church is by far the strongest motivator to get someone to step through the doors of your church. Not only can a good reason get people to be willing to not do something else, but it can convince them to look past their preconceived ideas and it can get them to find ways around those real-world obstacles. What are some of the more common reasons people don’t come to church? How has your church addressed real-life obstacles? What reasons does your church offer to get people to come to church? What if we gave people reasons to BE the Church? I honestly don’t want people to show up on Sunday morning if they’re not passionate about knowing, loving and serving Jesus and others. Let them stay home and sleep in or whatever. For those who do show up and who genuinely love Jesus and are eager to know how to follow Him daily I don’t need to coerce, manipulate or market them into a thriving encounter with the Risen Lord. Honestly, I’ve given up trying to attract people who don’t want to be in fellowship. Let the Lord build His Church as He said He would. Our job is to love Him, love others and make disciples who will do the same. In my opinion the bottom line is : no excuse is good enough where souls are at stake. The most important work of church-planters is calling people out of our own kingdoms to live in the Kingdom where Jesus is Lord. well, people will always be people finding tons of reasons to go or not to go. but respect to any belief or religion is still the best policy for me. Many people today just lost a lot of hope and it is very difficult to convince that things are not so bad. People really need a new hope. You have to try to give people faith in themselves, because it is the most important, as for me. Belief in God can also help in these troubled times! I think, in modern life people believe in nothing. It's ugly truth.